BMC is a 3 years full-time postgraduate course which is divided into 6 semesters. This degree is awarded in Mass Communication with concentrations in Journalism, Sports Communication, Advertising, Communication Studies, an International communication, and Public Relations. This study includes a variety of course offerings in New Media. The Mass Communication Program offers students an interdisciplinary foundation in the basic theory and skills necessary to become media practitioners and more informed media consumers. Mass Communication is a broader term which includes the study of various mass mediums. This study consists of journalism, radio, television, film making, online, public relations, advertising, event management etc. Students who want make a career in any of the aforementioned fields can take up this programme without giving a second thought. They have the opportunity to pursue internships and independent projects that allow them to have real world experience in the mass media professions. Graduates of BMC course have gone on to a variety of careers in the media field, corporate communication, including those in advertising, public relations, journalism and broadcasting. Some interested in graduate studies have also advanced to graduate schools across the country. This study enables them to choose a career from various stages of media production. This study with an emphasis on the social and cultural impact of various media forms, this course examines the practices, technologies, and policies that drive modern media communications. All these forms of mass media make it easy for journalists to spread news or information. This study has contributed greatly towards the development of mass communication. There are numerous job opportunities associated with the field of mass communication, and ranging from journalism to technical jobs. The average annual course fee for BMC course ranges anywhere between INR 50,000 to 20 lacs depending upon the institute offering the course. The average salary offered for this course in India to successful postgraduates of the course ranges between INR 2 lakhs to 10 lakhs depending upon the candidate’s expertise in the field. Bachelor of Mass Communication (BMC): What is it all about? Mass communication is the process of disseminating information through a medium to a large and diverse audience. BMC course is a form of public communication, where the message or information is transmitted electronically or mechanically. Mass Media is the medium or agent through which information or message is disseminated. The whole process in this study is spreading or circulating the information by a person, through a medium in mass media so that it reaches vast audience is called mass communication. Mass Communication is made up of branches like PR, journalism, advertising and mass media. This study is the main reason why journalism is an important part of many mass communication programs. Nowadays Journalism and Mass Communication is a very well-known course combination. Applicants having completed their 10+2 in any discipline from any recognized Board or Council or University with a minimum of 50% (45% for SC/ST) aggregate marks, or equivalent grades are eligible to seek admission. Students expecting their 12th results may also apply. First Round – students will have to appear for the Entrance Test conducted by various institutes. This exam is a common objective and written test which is held in several cities across India. Students will be shortlisted for the second round on the basis of their entrance test score. Second Round – If they are shortlisted, they will have to be present at the Centre for the duration of three-four hours for the same. In this round they will have to take a writing ability test, they have certain documents verified and participate in a studio test as well as a personal interaction. Electronic media has dominated the mass communication field for a while now. These days the internet has also emerged as a key player in this sector. Some lucrative job opportunities are associated with these forms of media. Radio channels TV channels and online portals are the best places where one may find a job. Though print media forms like Newspapers and magazines have been overtaken by the electronic media, candidates still do enjoy decent consumption. 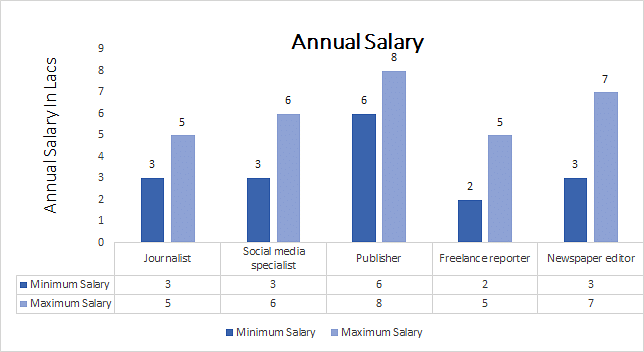 This is safe to say that mass communication graduates may find a job at print media sector too mostly newspapers and magazines. Since mass communication is made up of parts like journalism, reporting, and mass media etc. most are numerous job profiles available within this field. Some job that one lands depend upon one’s specialization to an extent.